Fond of Mutton Biryani, Mutton Kabab!! Enjoying these delicacies in Smart City Chandigarh. Hold On!! Its not safe. It is not veterinary certified edible product yet is selling in market openly without question. Now, you must be thinking, “What happened”. This is because Municipal Corporation house has passed the resolution of increasing fee of Slaughtering “Bakra” in Slaughtering Houses. The Fee is increased to Rs 30 to Rs 100/-. As a result, Slaughtering houses are closed and Private people are slaughtering Meat in City, Notably without getting it stamped or certified from Public health Department. 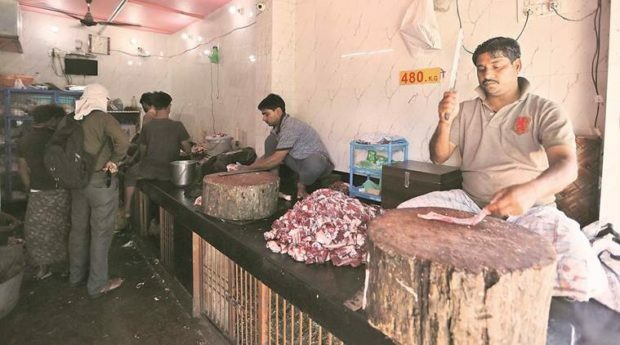 It is been last four days that Chandigarh Administration, Municipal Corporation and UT Health Department, none of them have taken nod on this while knowing the fact that Meat/Mutton is sold in city without getting Healthy essential clearance. Now, You will think, “What the Hell, Why Should we suffer?” and Why city Administration is sleeping? ” Fee hiking is not one person decision, it is a house decision. Slaughtering Houses are closed still Mutton is selling in Market without getting stamped. People who are doing this will face music for sure. We are not going to leave them. It is clearly not tolerable. We are getting it checked and whosoever found guilty would be punished as per law. Affects on Digestive system of Human body.